Tournament day like any other day starts by waking up. Some days you never slept so waking up is just a fantasy. Your first tournament can bring you this sleepless, restless and anticipating evening. What it also brings is an excitement level that is like no other and hard to describe. You just want to see your name in lights, the other fellows patting you on the back for a job well done. A job that made them all losers that day yet still they sing your praises. Well, it’s my dream I can glorify it if I want. No, this is not my first tournament. Ok, it’s only a hundred dollar per team North Valley Tackle open, not the Classic. For my partner, this day was his first tournament. I can remember mine like it was yesterday. The excitement was crazy! I had spent the whole week prior making sure my rod (yes, no plural) was ready to go. As a fish catching machine in my local ponds, I was about to step up and teach these B.A.S.S Club guys a thing or two about how to get it done. As the sun broke, my partner finished his beer (possible spoiler alert as to how the rest of the day would go) the other boats launched with us. I almost boiled over with excitement. Eight hours later no fish caught, two trips back to the camper to get more beer and everyone else with twelve plus pounds in their bags. I was hooked for ever! Now, I’m not going to brag but my partner with his first tournament day looming, didn’t have to deal with an unprepared drunk. No, I had put in the work and found quality fish. His day would be a good one. He was ready as well, five rods all with fresh line and lures suitable for Oroville fishing. Wide awake and ready to take on the day, he knew I would put him on fish. 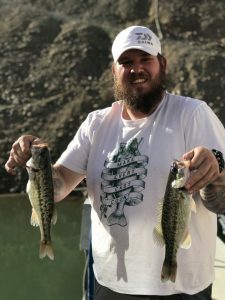 There was a good bite going on Oroville, lots of fish just had to find the kickers. We pulled up to our first spot put the trolling motor down then began fishing with topwater lures. Our first pass gave us nothing and then as we passed a boulder, he threw back with a spinnerbait. His line goes tight, he sets the hook and lands his first tournament bass. After working over the area thoroughly, I dropped the Carolina rigged Baby Brush Hog down. Instantly I caught a keeper then another and another the limit was in the boat. He would be weighing a limit of fish which was one of my goals for him. Next, cash a check. Unfortunately, thirty minutes later the tournament gods smite us. My trolling motor died. We worked hard to upgrade just beaching the boat and drifting through areas. The main lake was holding my better fish but the high winds kept us from fishing for them. I felt terrible! All he would say is “I’m having a great time”, we are weighing in a limit! Right there is why I love this sport. It didn’t matter that we weren’t going to win this event. Cashing a check would have been great but just being out there competing against some of the best anglers in the area, made the day for him. Sometimes we lose site of our first tournament. What it was like to be that bright eyed dreamer that knew that Shaw Grigsby, Bill Dance and Roland Martin had better start quaking in there boots. Because here I come! The dream fades a bit as you get older but the passion can hold true. If you ever get the chance, hell make the chance. Take someone out for their first event and embrace it. Keep your eyes and ears open the experience can be great for the both of you, just as mine was.